One of the Minor Prophets, to whom is attributed the collection of prophecies and apocalyptic visions constituting the book bearing his name. 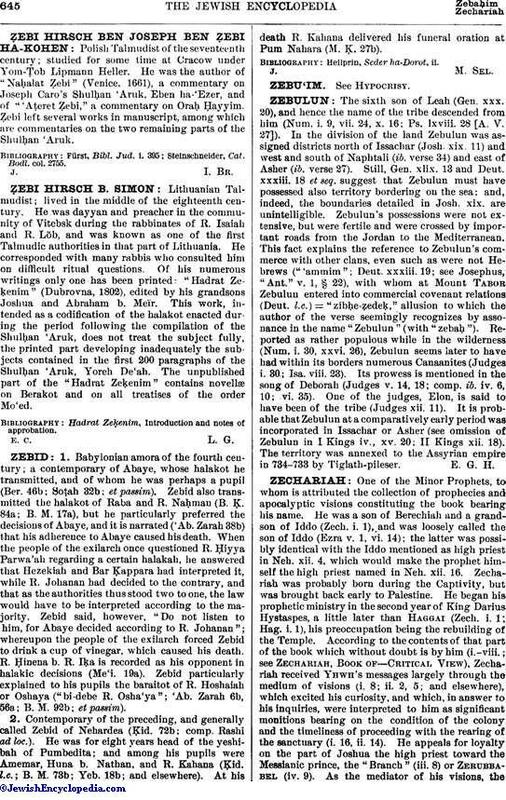 He was a son of Berechiah and a grandson of Iddo (Zech. i. 1), and was loosely called the son of Iddo (Ezra v. 1, vi. 14); the latter was possibly identical with the Iddo mentioned as high priest in Neh. xii. 4, which would make the prophet himself the high priest named in Neh. xii. 16. Zechariah was probably born during the Captivity, but was brought back early to Palestine. He began his prophetic ministry in the second year of King Darius Hystaspes, a little later than Haggai (Zech. i. 1; Hag. i. 1), his preoccupation being the rebuilding of the Temple. According to the contents of that part of the book which without doubt is by him (i.-viii. ; see Zechariah, Book of—Critical View), Zechariah received Yhwh's messages largely through the medium of visions (i. 8; ii. 2, 5; and elsewhere), which excited his curiosity, and which, in answer to his inquiries, were interpreted to him as significant monitions bearing on the condition of the colony and the timeliness of proceeding with the rearing of the sanctuary (i. 16, ii. 14). He appeals for loyalty on the part of Joshua the high priest toward the Messianic prince, the "Branch" (iii. 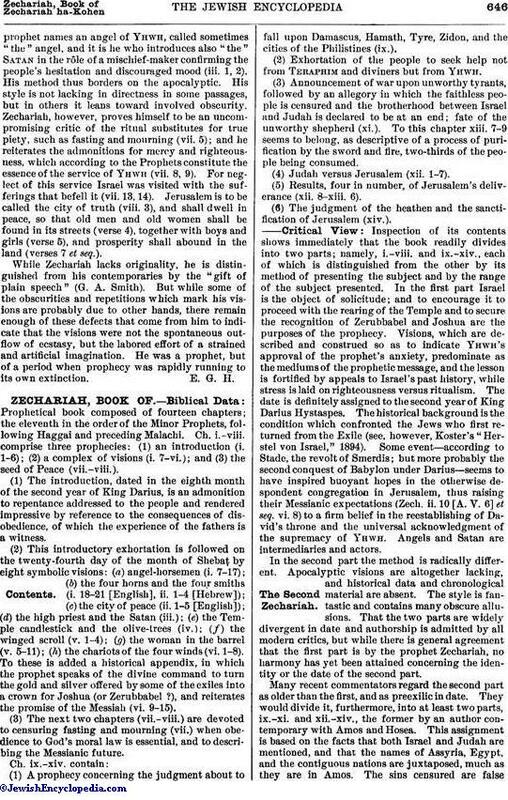 8) or Zerubbabel (iv. 9). As the mediator of his visions, theprophet names an angel of Yhwh, called sometimes "the" angel, and it is he who introduces also "the" Satan in the rôle of a mischief-maker confirming the people's hesitation and discouraged mood (iii. 1, 2). His method thus borders on the apocalyptic. His style is not lacking in directness in some passages, but in others it leans toward involved obscurity. Zechariah, however, proves himself to be an uncompromising critic of the ritual substitutes for true piety, such as fasting and mourning (vii. 5); and he reiterates the admonitions for mercy and righteousness, which according to the Prophets constitute the essence of the service of Yhwh (vii. 8, 9). For neglect of this service Israel was visited with the sufferings that befell it (vii. 13, 14). Jerusalem is to be called the city of truth (viii. 3), and shall dwell in peace, so that old men and old women shall be found in its streets (verse 4), together with boys and girls (verse 5), and prosperity shall abound in the land (verses 7 et seq.). While Zechariah lacks originality, he is distinguished from his contemporaries by the "gift of plain speech" (G. A. Smith). But while some of the obscurities and repetitions which mark his visions are probably due to other hands, there remain enough of these defects that come from him to indicate that the visions were not the spontaneous outflow of ecstasy, but the labored effort of a strained and artificial imagination. He was a prophet, but of a period when prophecy was rapidly running to its own extinction.